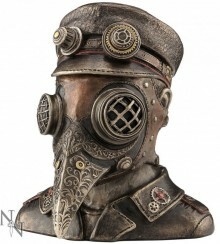 Solid Cold cast bronze resin figurine featuring a masked doctor, removable hat to reveal a secret box. Solid and weighty figurine for display. From the popular Nemesis Now Steampunk range.